Saving the bears: Rosemary Waugh reviews Karen Cogan’s unsettling Cork-set monologue. 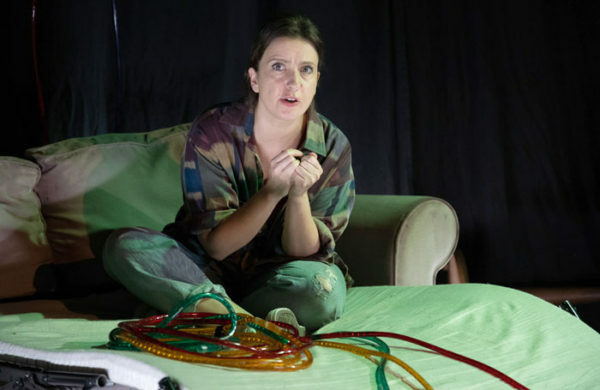 I see a lot of this ‘type’ of theatre; the one-woman monologue where the character will share an unlimited amount of details relating to their menstrual cycles, bad fucks and anti-health plans. Drip Feed, written and performed by Karen Cogan, ticks many of the same marketing-speak boxes. But in reality, its more than another story of bad decisions made via vodka. It’s more unsettling and it’s far more sad. Brenda lives in Cork, not far from her girlfriend Olivia. Only Olivia’s not really her girlfriend, she’s an ex. And not even a recent ex, they’ve been apart for quite a while. But Brenda won’t accept this, which is how we first find her clambering around Olivia’s wheelie bins desperate to be as near to Olivia as possible, but also desperate not to be seen. Cogan’s script is best in its little details, not the stand-out ones about period clots, but the mundane reflections on, for example, the type of person who has a separate house just for their bins. It’s through these throwaway lines that the piece becomes affecting or, rather, it’s these seemingly irrelevant details that stick in the memory after watching it. The item Brenda steals from the bin house is a discarded painting of Olivia completed by her new girlfriend. Liberated from the trash, Brenda transports the image around the city with her by hiding it in her own trousers. Later on, when hideously drunk, she redelivers the artwork to Olivia’s house, this time with some additions of her own in the form of scrawled-on insults of the ‘whore’ variety. But the detail that prickles most of all are the teddy bears Brenda’s flatmate and friend Veronica insists on purchasing from every charity shop in Cork (‘they have such sad eyes’) just prior to her admittance into hospital for mental health reasons. Is it just me who find the image of a mound of rescued teddy bears irredeemably sad? I mean, honestly, I could weep reflecting even briefly on the idea of a woman, in her moment of acute distress, trawling the charity shops on a mission to set free the bears. It’s like it releases a vat of maternal longing in me to scoop up Veronica and Brenda just like those fluffy toys and keep them safe from the terrors of being sold second-hand and the terrors of… everything, really. Veronica’s story, as it happens, gets a whole lot sadder than a bunch of 50p teddies. But it’s the idea of a new ted, bought from the window because of his absurd squashed-in face poking its nose out from the top of a bag (that, and a My Little Pony pillowcase) that haunts in the end. Drip Feed is on until 26 August 2018 at Assembly George Square. Click here for more details.